Pinterest - It's not only a good place to find recipes and craft ideas, it also has tons of great educational ideas. 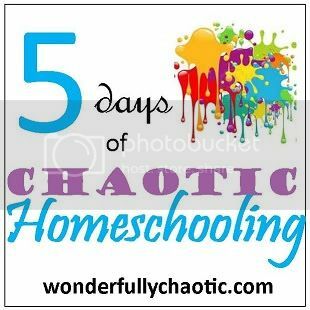 I have a whole board of homeschool resources that I've been slowly integrating into our homeschool. I also have another board called "Stuff for the Kiddos" that is full of easy crafts, projects, and other entertaining things that I dig into when they need a change or want something fun to do. If we've been having a particularly chaotic week, sometimes it's nice for the kids to relax and play with a fun craft. Music - This might sound simple to some but music is one thing that helps me to keep calm in the midst of chaos. I love listening to classical music especially. I've also noticed that music can have an effect on my children as well - if we listen to something that's upbeat, they're more likely to be dancing around and jumping. On the other hand, if we listen to a ballad that's slow and lilting they often want to sit and listen, and it sometimes helps them to calm down. So now that you've heard my sanity savers, I'd like to hear about yours! What is your saving grace when everything is chaotic? I'd love to hear your thoughts in the comments!